This Easter basket is not all about cutesy bunnies and baby chicks, it's about sweet simplicity. 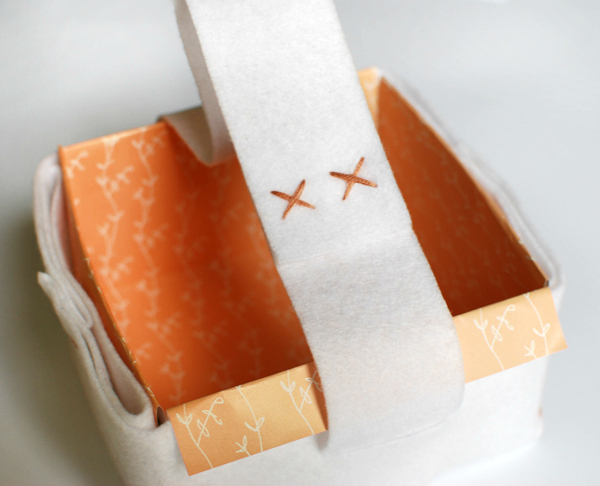 Lined with pretty paper this little felt basket is perfect for collecting or giving sweet treats. Light to mid weight cardboard - a cereal box is good. 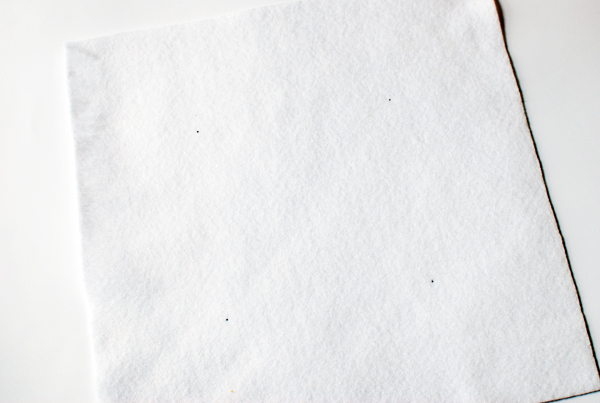 Iron and pressing cloth (a tea towel or similar). 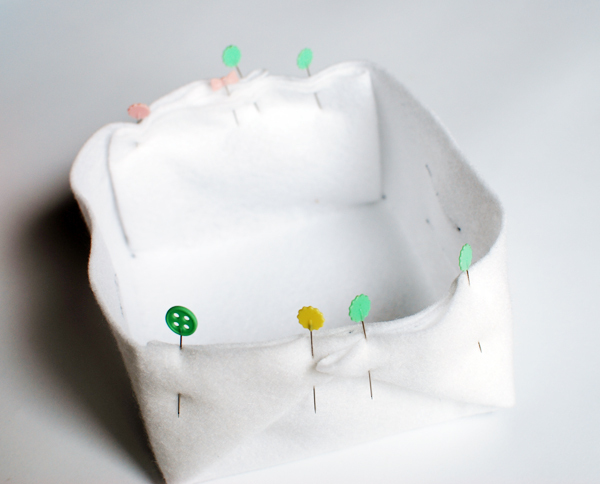 Cut a piece of felt for the basket measuring 28cm (11 inches) square. 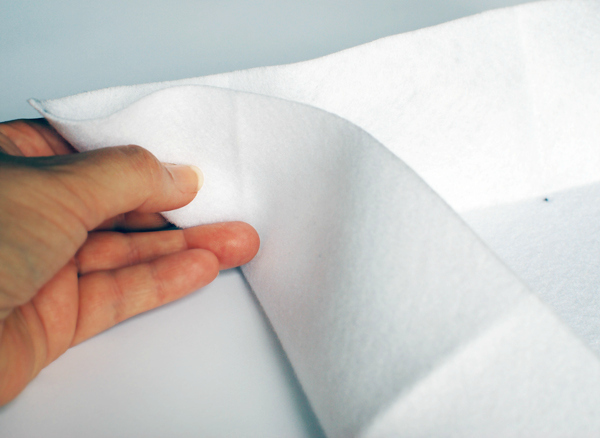 For the handle, cut a strip of felt measuring 4cm x 56cm (1.5 x 22 inches). 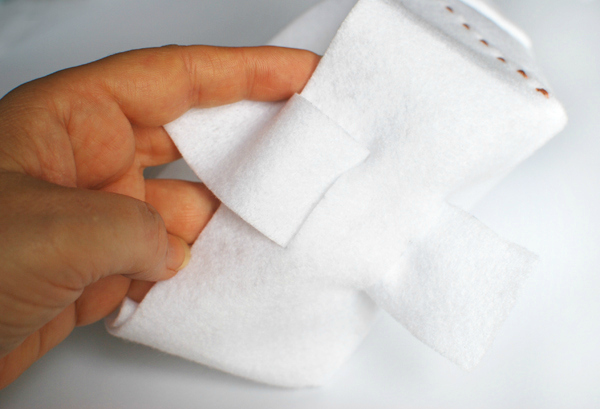 It's easiest to cut the handle if you fold a piece of felt in half. 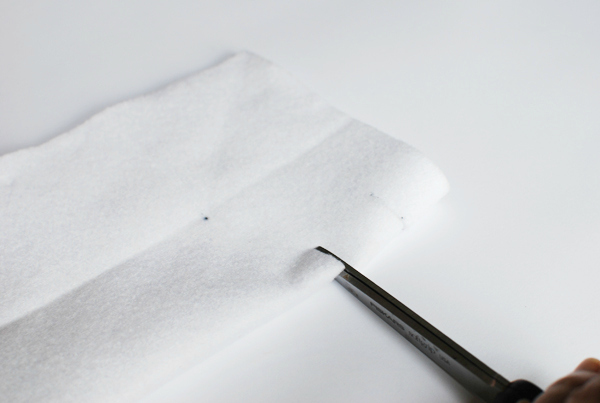 Draw the cutting lines on the felt with a fine marker - place them slightly further apart than the specified measurement and then cut inside the lines so you cut the marker lines off. 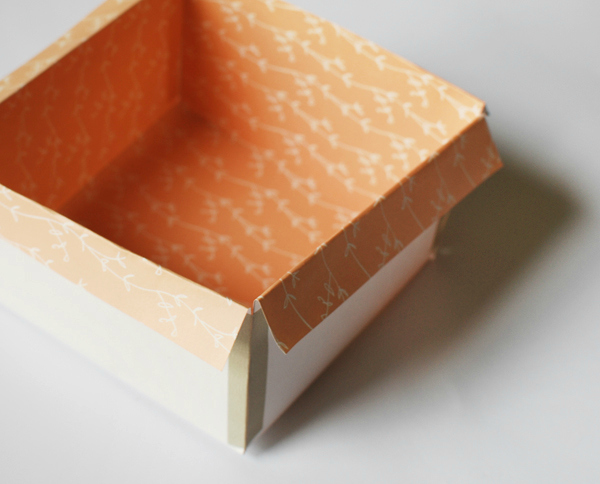 Cut the cardboard to 12cm x 12cm (5 inches) square. Cut two pieces if your cardboard is thin. Note: throughout this tutorial the measurements in centimetres haven't been converted exactly to inches. I am trying to avoid you having to measure in small fractions of inches. The base of the basket will measure 12cm x 12cm (5 inches) square. Measure 8cm (3 inches) in from each side and mark a small dot where the corners of the base will be. 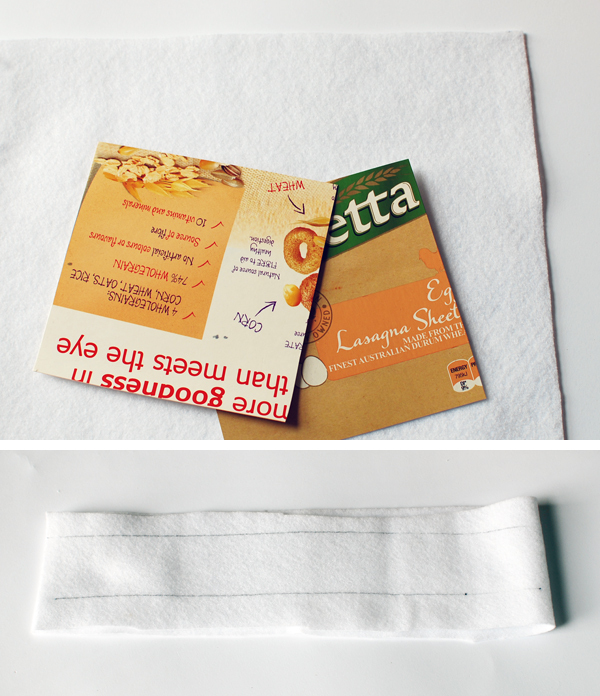 Fold over each side of the felt and press the creases in place with a tea towel between the iron and the felt. There will be four slits for the handles to feed through. 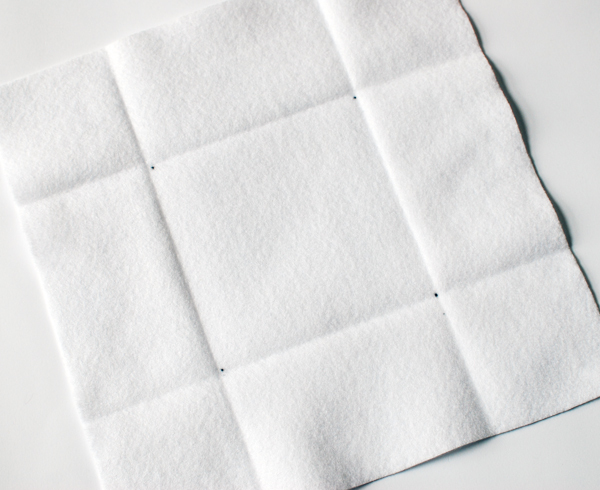 Measure 2.5cm (1 inch) in from the bottom edge of the felt square and mark the first cut, which is 4cm (1.5 inches) long and centered. Measure 3cm (1 inch) in from the first cut and mark the second cut, also 4cm long and centered. The two cut marks will be parallel and 3cm (1 inch) apart. Now measure in from the opposite side of the felt square and make the same two marks for the handles. Fold the felt in half to cut the four handle slits. 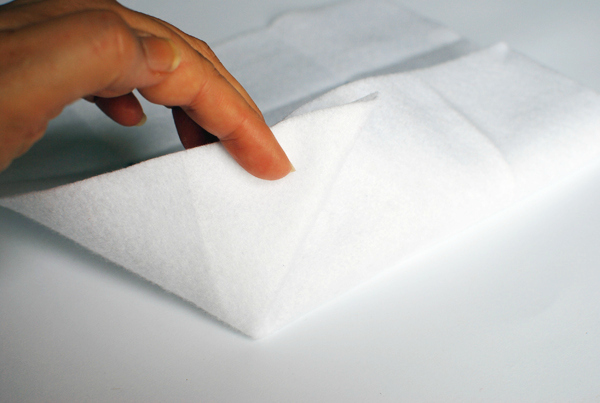 Take one corner and fold the felt so the two edges meet. This will make a diagonal fold line running from the outside corner to the base corner where you drew the dot with the marker. Fold the triangle piece you just made over to the basket side that doesn't have handle slits. Pin it in place and repeat for the other three corners. 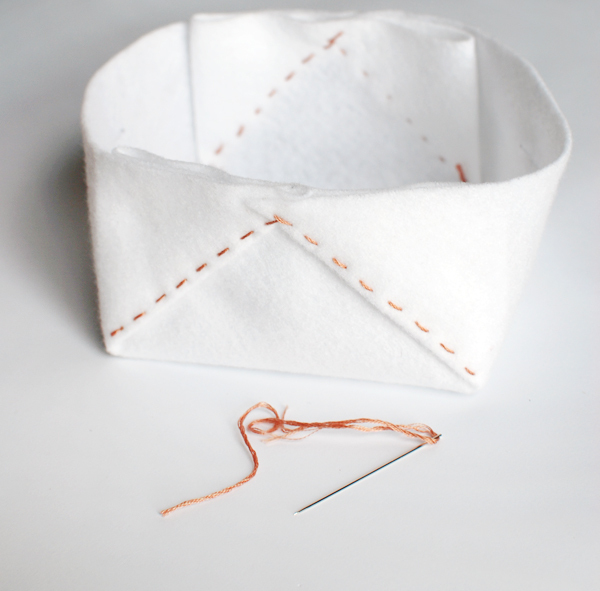 Using large running stitches, sew along the edges of the folded corners. Insert the handles into the basket, and starting at the top edge weave the handle in and out, under the basket, and in and out the other side. Cut a square measuring 32cm x 32 cm (12.5 inches) from the wrapping paper. 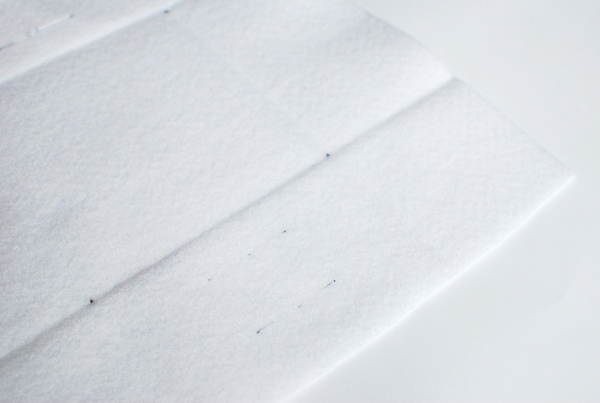 On the back of the wrapping paper measure and rule lines 9cm (3 and three quarters of an inch) in from each side. 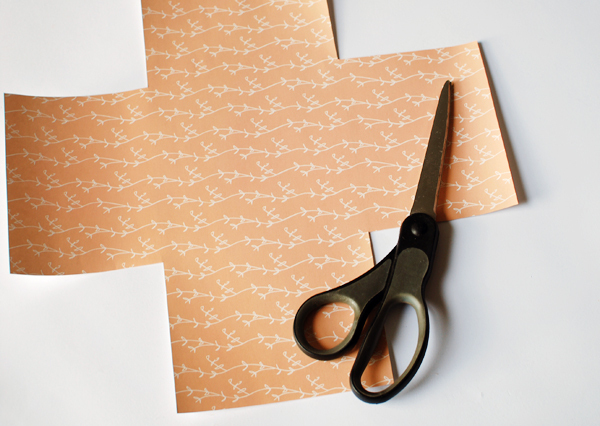 Cut along the lines to form a cross shape. Still on the back of the paper measure in 2cm (three quarters of an inch) from each edge. Fold along these lines, turn the paper over so the printed side is facing up and fold along the second set of lines to form a cube. Place the paper insert into the basket - you can fold the paper over the edges of the felt basket under the handles, or tuck all the paper edges inside the basket. Secure the two overlapping ends of the handle using large cross stitches. 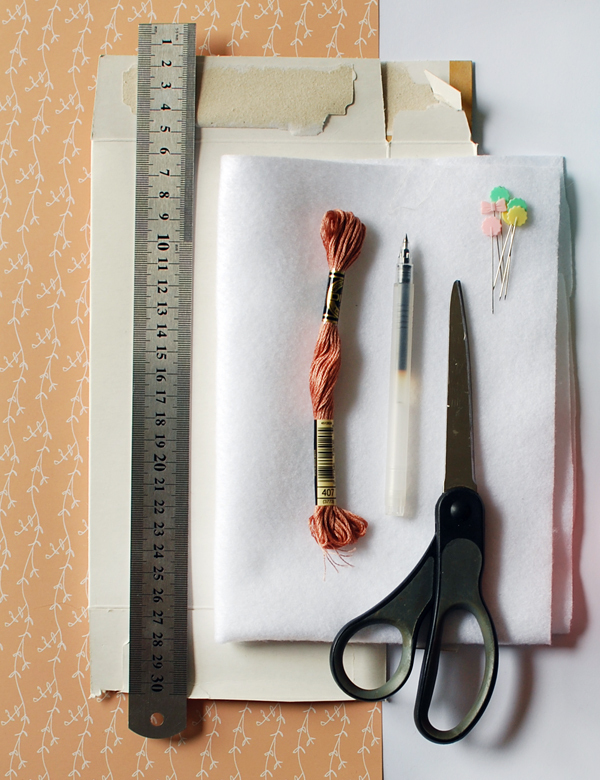 Hide the ends of the thread by beginning and ending the stitches between the two pieces of felt. You've now completed your little felt Easter basket and it's ready to be filled with eggs. You can leave the basket as it is or add some pom poms for extra colour. 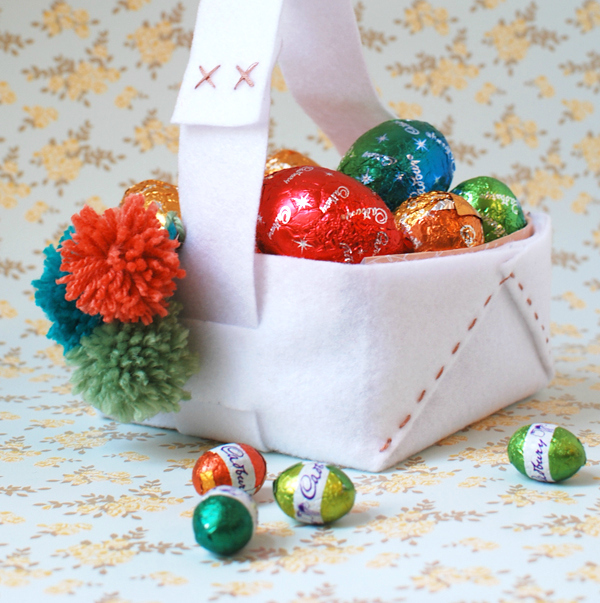 It's almost Easter - are you going to try making this simple felt Easter basket? With or without pom-poms? You tell us!